Of course we all know that in order to lose body fat we need to burn more calories on a regular basis. I’m going to share a few super simple fat loss tips that it will make the process so much easier! A nutritious meal plan in combination with following a consistent workout program is the best way to lose weight successfully but you can also burn more calories on top of that by increasing your ‘incidental activity’. Incidental activity or exercise is that which occurs during our everyday normal routine, like climbing the stairs at home or work, walking the dog or scrubbing the floor. 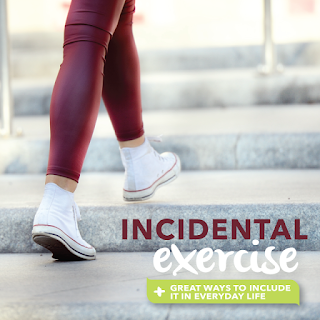 Incidental activity isn’t something you would count as exercise necessarily, but it does indeed burn calories. If you consciously focus on increasing your incidental activity in addition to following a healthy weight loss program, losing weight becomes much easier. There are a number of ways to burn more calories through incidental exercise. I’ve listed a few examples below and I encourage you to be creative and resourceful in coming up with some of your own. Share your ideas with your fellow TpxMuscle members by posting a comment after the post! Always take the stairs! Ignore the elevators and escalators! Don’t be shy! Let us know what you do to burn more calories throughout your day!